Most people who know me would say I'm generally a happy guy--rather optimistic by nature. By I've always been a bit skeptical about books on the subject of happiness. My concern is that they would be filled with shallow platitudes, assuming that the ultimate goal for ourselves is self-focused pleasure. Thankfully, that bias didn't keep me from agreeing to read Michelle Gielan's new book Broadcasting Happiness: The Science of Igniting and Sustaining Positive Change. 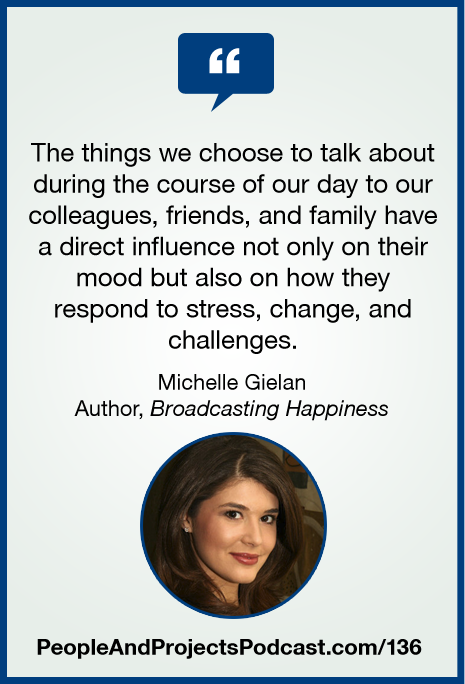 To learn more about Michelle and the work of her organization, visit http://BroadcastingHappiness.com/. As part of our ongoing experimentation here at the People and Projects Podcast, we're going to be conducting some Periscopes during the month of October 2015. Each Friday, starting October 9, 2015, for 4 Friday's, I'll be broadcasting a periscope from 12:15pm Central in the US (GMT-5). If you haven't downloaded the app, please do so and then join me for these brief, 15-minute discussions. You can find my Periscope home page at https://www.Periscope.tv/andy_kaufman. I would love to have the opportunity to connect with you in this way so join me in October! Check out our Essentials of Project Management e-learning workshop! Use a coupon code of ESSENTIALS-50 to save USD $150. Go to http://courses.i-leadonline.com/courses/essentials-of-pm to learn more. Honestly, this movie cracks me up. I couldn't help but put Unikitty in this episode. Who's your favorite character in the movie?